My Categories: Gestalt Therapy, Trauma. 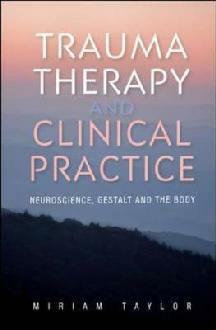 This book weaves together the experience of trauma, neuroscience and Gestalt theory and applies these to clients. Miriam Taylor is a Gestalt psychotherapist, supervisor and trainer. With a background in adult education she later worked clinically for some years with young people. From this she developed her focus on trauma. She works in private practice and at a trauma service. She teaches at Metanoia Institute, UK, and elsewhere.